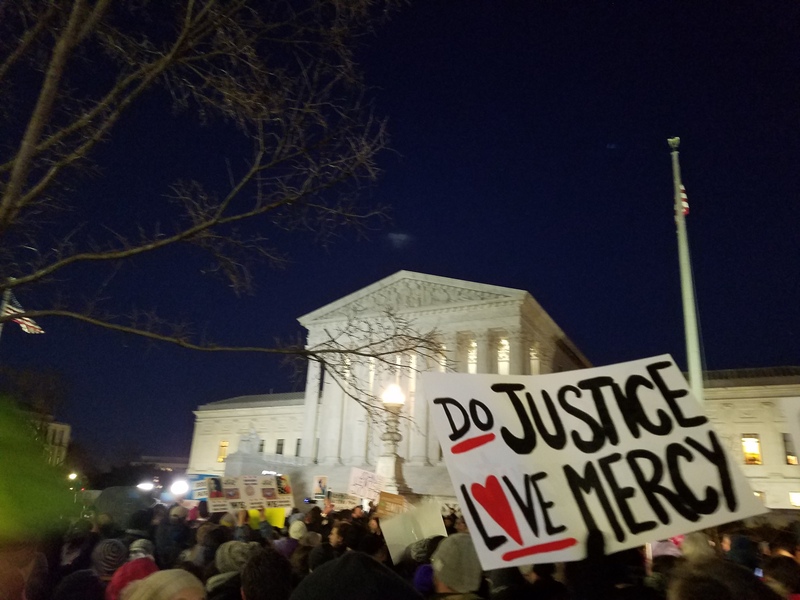 WASHINGTON (CN) – Congressional Democrats on Monday joined a protest outside the Supreme Court demanding President Donald Trump repeal his executive order preventing people from seven Muslim-majority countries from entering the United States. Senate and House Democrats held electric candles as they called on Trump to repeal the order, which they called unconstitutional and against American values. 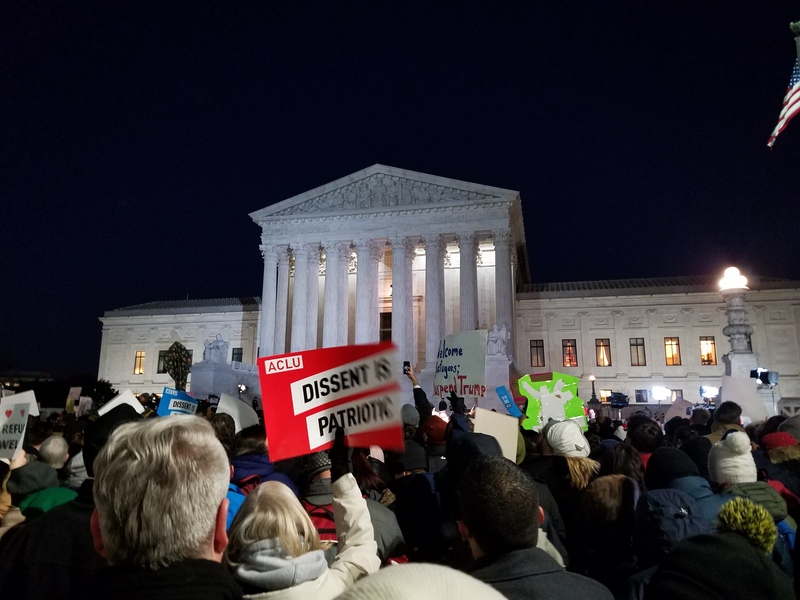 Meanwhile, hundreds of protesters held signs and chanted on the sidewalk at the base of the Supreme Court steps. The lawmakers told stories from their home districts and said the order, which Trump handed down on Friday, will serve as a recruiting tool for terrorist organizations and to alienate allies oversees. The protest completely engulfed the Democrats, making it difficult to work through the crowd to get to the podium from which the lawmakers delivered speeches. The crowd’s chants sometimes drowned out the lawmakers, even when they spoke through a megaphone, and appeared to make it difficult for them to hear one another to coordinate the event. At one point the crowd broke into chants of “Bernie, Bernie” as the lawmakers discussed who would speak next. Other chants included “No hate, no fear, refugees are welcome here,” “No ban, no wall,” and others that have become common at protests against Trump. While the protest and press conference was ongoing, Acting Attorney General Sally Yates told Justice Department employees not to prepare legal arguments supporting Trump’s executive order. A group of State Department “consular officials” also registered their dissent with Trump’s order, writing the ban will not achieve its aims and will “immediately sour relations” with the affected nations and much of the Muslim world – who would see the ban as religiously motivated, the group said. Also joining the lawmakers outside of the Supreme Court were two people who recently came to the United States from countries that Trump targeted in the ban – a filmmaker of Syrian descent and an Iraqi woman who married a member of the military. The lawmakers spoke in the cold Washington night for more than 30 minutes, just after the Senate advanced former Exxon Mobil CEO Rex Tillerson, Trump’s pick for secretary of state. Protests have broken out in cities across the nation since Trump’s order went into effect on Friday, many at airports where people who were in transit when the order came down have been detained. Dozens of challenges have been filed in courts, with federal judges in New York, Massachusetts, Virginia, Washington and California issuing injunctions against the order shortly after it went into effect. Secretary of Homeland Security John Kelly on Sunday issued a statement clarifying that “lawful permanent residents” will be exempt from Trump’s order, which bars refugees and visa holders from Iran, Iraq, Syria, Libya, Sudan, Somalia and Yemen.